Published April 20, 2019 at 12:56 p.m.
Back in 2013, with the 15th pick in the NBA Draft, the Milwaukee Bucks took a risk on a thin, untested, unknown and raw babyfaced teenager with just a handful of impressive clips against limited competition. He was the definition of a question mark – from his uncertain potential to even just pronouncing his name. Just a few years later, that question mark has proven to be an exclamation point. (Or maybe a whole mess of punctuation if you're unfortunate enough to play against him.) Giannis Antetokounmpo has proven to not only be the best player in his draft class, but possibly the best player in Milwaukee Bucks history and maybe the best player of his time. He's been a highlight machine with MVP-like numbers – and we still haven't seen the roof of his abilities yet. And in the process, he's rejuvenated a once-middling, mediocre franchise and the entire city of Milwaukee, sparking a new arena, a new Downtown district and a new sense of optimism. Now, we could discuss why we love Giannis using the impressive statistics and wins he's accumulated over these past several seasons – but that's just part of the equation. The boring part, at that. No, it's not just the numbers that make the Greek Freak beloved around Brew City. It's the stylish way he's racked up those numbers on the court – and the charming personality he's shown off of it – that's already made the 24-year-old an icon. So putting those boring numbers aside, here's a list of reasons – 34 of them, because duh – why we geek out over the Greek Freak. Even before Giannis set foot on the court, we were fans of the Greek Freak and his incredible story, growing up as poor in Greece as the son of Nigerian immigrants before making it to America and the NBA – all while keeping his family and his heritage near and dear along the journey. His talents and his legend have only grown since his rookie year in 2013, but as he climbs closer and closer to the NBA's highest honors, it's worth remembering where it all began, when Giannis was still just an unknown lanky kid with a lot of great potential and an even greater story. Giannis Antetokounmpo: the best thing to happen to smoothies since the invention of the blender. ... and, of course, Funyuns. Raise your hand if you would watch a "Diners, Drive-ins and Dives"-esque food show starring Giannis touring the country, trying dishes and snack foods, and loving America. That's what I thought. Make it happen, Food Network. I can even picture Giannis in a red convertible, wearing a flaming bowling shirt with a pair of sunglasses perched behind his head. Between that story and his foodie tweets, Giannis might be the only good, honest and innocent thing on social media. For his first few seasons in the NBA, Giannis was the scrawny potential star with the childlike smiling face. But in 2015, near the end of his second year with the Bucks, he gave everyone a glimpse at the face of the future. Not only would that moment preview Giannis' takeover of the league, with many more mean mugs in tow, but it also marked the first installment of his true crime series, "Giannis and the Murder of the New York Knicks." Because, honestly, who hasn't wanted to knock Mike Dunleavy into next week? If you're going to bomb out of the playoffs, losing by almost double your point total, might as well do it while blasting one of the league's quietly more punchable players into the crowd. The Bucks' big 2015 home win over the then-undefeated Golden State Warriors featured plenty of highlights on the court, but the definitive best of the bunch happened above it, played on the Jumbotron during a timeout. The fact that Giannis has never been on "Car Pool Karaoke" or "Lip Sync Battle" is frankly criminal, and I would like to order a federal inquiry into this matter. We the American public should demand better of our entertainment. Thankfully Giannis didn't commit too hard to his Bieber impression and start peeing in mop buckets. And now for the next installment of the true crime saga, "Giannis and the Murder of the New York Knicks." Someone should pass this along to Ryan Hollins. When Giannis made his first All-Star Game in 2017, he must've had one mission in mind: Make Steph Curry's life utterly miserable. Jeez, with all the posterization and disrespect Giannis was dropping upon the Warriors superstar, you'd almost think Steph Curry was wearing a New York Knicks jersey out there. Now these are some prank calls that we can all get behind. An important lesson for all future Bucks draft picks: Do not forget your rookie duties. Or you may end up with more popcorn than a movie theater. Enjoy this gorgeously produced, thrillingly made, evocatively shot, movingly told and Giannis-narrated ... advertisement for Greek chocolate milk. Even his commercials are better than everyone else's commercials! So ... uh ... how about those basketball skills?! It's not very often you see a home crowd raucously cheering, chanting and singing a rival player's name. But then again, Giannis is no normal player, as you can see with this clip of Greek Cleveland Cavaliers fans sticking around after a game to shower Giannis with appreciation. 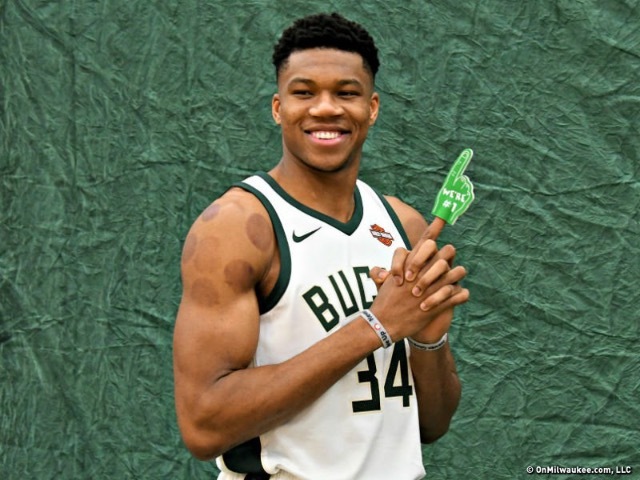 Point one: Giannis is so charming that he manages to make insulting the brand of an entire family sweet and delightful. (Of course, it helps if that brand is LaVar Ball's.) Point two: How many Big Baller Brand shirts did Giannis see at his next postgame autograph go-around? I imagine it had to be deep into the double-digits. I hope he was wearing a lot of shirts – and knowing Giannis, he probably did. I'm just saying, if the Green Bay Packers ever get into injury trouble (and knowing the Packers, they definitely will) and they need an emergency long snapper, I know a guy. Is there nothing Giannis can't do?!?! Well, uh, apparently there IS something Giannis can't do: get a table at BelAir Cantina after a big playoff win. But while the internet broke down about this 2018 non-starter of a controversy – it turns out the place was just busy, not rude – with everybody getting in on the overblown action (guilty as charged), Giannis kept his head above it all and effectively diffused the situation, explaining that it was never a big deal and complementing the taco hotspot in the process. Considering the rapper has already written an ode to the Green Bay Packers, it shouldn't be too surprising that he'd make another musical reference to a Wisconsin sports icon. Here's to Lil Wayne busting this out at his 2019 Summerfest headliner gig – with hopefully the Greek Freak in the crowd to hear it. 19. That time he dunked the soul out of poor Tim Hardaway Jr.
And now, the epic conclusion to the "Giannis and the Murder of the New York Knicks" trilogy. You thought Giannis was charming? Wait until you meet the Antetokounmpup. OK, her name isn't Antetokounmpup; it's Mila. And she's almost as delightful as her owner. The only problem: She hasn't posted since August 2018. Not posting enough puppy photos is literally Giannis' only shortcoming. We here at OnMilwaukee generally believe in ignoring full-time Fox Sports personality and part-time Skeletor cosplayer Skip Bayless, and not giving his diseased hot takes the oxygen they need to spread and infect society. But we'll overlook that for a brief moment to enjoy Giannis talking back to the talking head over Twitter last offseason. Who needs rapping flight attendants when, thanks for this 2019 in-flight safety clip from Aegean Airlines, you could have a smiling Giannis hanging out with knitting old ladies and fishermen while teaching soon-to-be fliers how to click their seatbelts together and put on their oxygen masks? Plus, if anybody would be an expert on taking flight, it'd be our own dunk-happy Greek Freak. Two years after spending half of the All-Star Game getting dunked on by Giannis and the other half nervously looking up in fear of getting dunked on by Giannis, Warriors sharpshooter Steph Curry must've decided that if you can't beat 'em, join 'em. For '90s Night in February, the Bucks brought in rapper and Fyre Festival co-mastermind Ja Rule to perform at halftime. And while it definitely wasn't the worst concert-related event the rapper has been involved with, it also didn't earn much respect from the Greek Freak. He's already a potential football long-snapper and forward in soccer, so might as well put him the Brewers bullpen while we're at it. Someone's taking this year's MVP race VERY seriously. So before when I said Giannis might be the only good, honest and innocent thing on social media? Maybe I should just say good and honest. 28. That time he made fun of LeBron's "tampering"
We've all had fun laughing at the sparkly dumpster fire that's been the 2018-19 Los Angeles Lakes – and "we" includes Giannis, who dropped this solid zinger in the midst of the NBA All-Star Game live draft. Jon Leuer played all four years of his college basketball career as a Wisconsin Badger. He was then drafted by the Milwaukee Bucks in 2011 and played his first year in professional basketball in the very state where he made his name in school. And Giannis cared NOT ONE BIT about any of that during this devastating dunk from January 2019. In November of 2015, Tim Bontemps of the Washington Post sat down for a conversation with rising star Giannis Antetokounmpo and asked him some casual icebreaker-type questions. One of those exchanges? Fast-forward to January 2019, please. Why yes, that is Giannis (and the rest of the Bucks) on J. Cole's Instagram, photographed dropping by the famous rapper's Dreamville studio in Atlanta and checking out some of the recording sessions for his upcoming compilation album. Believe in your dreams, y'all. So that Washington Post interview I mentioned above? The whole thing is a charmer – from Giannis listing off some more foods he tried for the first time in America to citing "Coming to America" as his favorite movie (get pumped, Giannis; there's a sequel coming out!) and calling "Ellen" his favorite television show. And his likely job if basketball didn't exist? Security guard. The whole thing is filled with endearing gems – and sure, it's from 2015, so maybe he's found a new favorite TV show, but his low-key, modest charm hasn't seemed to change at all. In this social media, brand-centric era in sports, finding a truly authentic and honest moment of connection between an athlete and a fan – one created by genuine emotion and thoughtfulness rather than some clever adversing execs or sneaky PR gurus – feels even more special and rare. This 2019 clip of Giannis meeting a 11-year-old fan at a signing event, taking a thoughtful minute to look at her artwork and to thank her for the drawings while she cries in happiness and excitement, is one of those special and rare moments. Let's be honest: If you got a quarter for every fanbase that was CONVINCED that their star player loved their city like no other and was guaranteed to stay there for life, only to watch their favorite son leave town for better money or championship potential, you'd have almost enough money to buy all those fans new jerseys after they burned their old ones. But I don't think it's naive to say that Giannis feels different. Even since his earliest days in Milwaukee, he's talked about how he enjoys the city and its modestly exciting vibe – from noting in that 2015 Washington Post interview that, "Milwaukee is quiet. It's a really nice city. I like that it's quiet," to claiming his loyalty on Twitter and in a New York Times profile two years later. His desire for low-key living and Milwaukee's modest but mighty market hasn't seemed to go sour as time's gone on either, as just last week he told ESPN that he turned down the massive spotlight of "Space Jam 2" not only to keep working out with the team, but because, "I don't like being Hollywood." With sentiments like that, and the on-court success Giannis has found here, it sounds like we'll be adding to this list for many years to come.